Rimfire is a light blend of Central American and South American coffees. This Central and South american blend bring fruit and hints of chocolate together for a light refreshing coffee. This is our"Rimfire" roast, which is a lighter roast or try the "Centerfire" roast if you like a darker roast! Wake up every morning to the smell of FREEDOM! 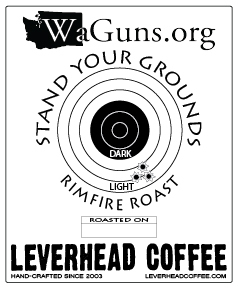 Larry's Coffees will donate $1 to WaGuns.org for each pound of Rimfire coffee sold.